In response to demolition, Yishai's party promises to be right-wing anchor in government, demand end to destruction. In response to the IDF Civil Administration's demolition on Tuesday morning of the Geulat Tzion community near Shiloh in Samaria, as well as several other homes in the area, Eli Yishai's Yachad - Ha'am Itanu party pledged that once accepted into a coalition it will demand a paradigm shift in the way the government views Judea and Samaria. At Geulat Tzion, two families with babies - one a mere month old - were forced out into the cold while their homes were destroyed by heavy equipment. The forces then blocked access to nearby Yishuv Hada'at, and knocked down a building in Adei Ad. 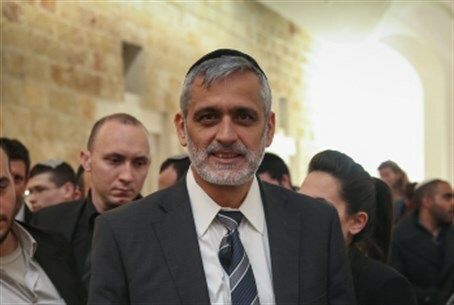 MK Yoni Chetboun of Ha'am Itanu, which recently formed a joint list with the Otzma Yehudit party, stated that in the next government his party will prevent such demolition of Jewish communities from recurring. "The destruction of Jewish homes this morning in the Shiloh Bloc proves again that a right-wing party loyal to the land is needed," declared Chetboun. "Tzipi (Livni) pulled the government to the left, and the High Court is outlining policies opposed to the opinion of the majority of the public. G-d willing we will be the anchor on the right of the next government." Another candidate for the party, Amital Bar-Eli who is sixth on the party list and founder and director of the Hotam Forum, as well as being a founder of the Magen Dan neighborhood of Elkana, said the party would demand such demolitions cease. "The continuation of the destruction in the settlements in Judea and Samaria is unacceptable. We don't understand where this obsession comes from, when the illegal settlements in the Negev and Galilee don't bother those who raise a fuss about the law," he said, in a reference to the widespread illegal Arab and Bedouin construction in those areas. "It is very serious that these acts occur despite the establishment of a right-wing government as it were," he added in a jab at the Likud and Jewish Home coalition. "G-d willing we will enter the government and demand an end to the destruction, and of course a renewal in the momentum of building in all parts of the land of Israel." Rabbi Ya'akov Yakir, a resident of Psagot to the north of Jerusalem who teaches at Yeshivat Beit Orot and is number eight on the party list, said "the visions of destruction in the outposts, which has repeated itself in the last two years, don't give any rest." "On the government's table is the report of the Judge Edmond Levy that determines that the policy of enforcement against Jews in Judea and Samaria is draconian and needs to be changed drastically," said Rabbi Yakir. "We will demand the adoption of the Levy Report and an end to the destruction of outposts." The Levy Report of 2012 proved conclusively that the Jewish presence in Judea and Samaria is legal according to international law, but despite the report being commissioned by Binyamin Netanyahu's government it has yet to be adopted.